Coverage: Live on BBC One, BBC Radio 5 live, BBC Radio London and live text commentary on the BBC Sport website. The 46th Women's FA Cup Final between Arsenal and Chelsea is set to see a competition-record crowd venture down Wembley Way, to watch two sides which include 12 senior England internationals. Players such as striker Eniola Aluko - the star of Chelsea's win over Notts County in last year's final - and legendary Arsenal forward Kelly Smith may be familiar names, but the domestic game in England now boasts more overseas stars than ever before. So who are the players to look out for on Saturday? Manager Emma Hayes has called her Chelsea's 'little magician' and South Korea forward Ji So-Yun certainly has the skill to conjure up goals for the Blues. Having netted the only goal in last year's final and in Chelsea's 2015 semi-final win over Manchester City, Ji's goals were crucial to her side winning their first major trophy. And the 2015 PFA Women's Player of the Year has been at it again in the cup already this year, as her precise free-kick saved Chelsea in the semi-finals against City in April, sending the match into extra-time, when they had looked destined for a frustrating exit. Unquestionably one of the most skilful female players in the world, Ji has the natural ability to steal the limelight at Wembley and be a match-winner once again. Nigeria forward Asisat Oshoala, who has 11 goals in 17 international appearances, could be one of Arsenal's wildcard picks on Saturday. The 2015 BBC Women's Footballer of the Year, who finished as the top scorer at the Women's Under-20 World Cup in 2014, joined the Gunners from Liverpool in March and scored on her league debut against Reading. Her pace can hurt any team, but it is not clear whether she will start for Pedro Martinez Losa's side, having made three starts and three substitute appearances so far this season. Having won nine FA Cups already in her career, Chelsea's Katie Chapman will be bidding to add yet another medal to her illustrious CV, and this time she is up against her former club. But she is also facing her England team-mate, and the Lionesses' most-capped player, Fara Williams. Like Oshoala, Williams moved from Liverpool this winter, leaving a club with whom she had won back-to-back league titles in 2013 and 2014. The two veterans of the English game will go head-to-head for control of the midfield at Wembley - but could another, younger, Lioness take the headlines instead? Arsenal midfielder Jordan Nobbs, 23, has already shown she can produce goals in big games, netting a superb brace in November's Continental Cup final, as Arsenal beat Notts County 3-0. If you're looking for a player who has shown she can handle serious pressure, look no further than Arsenal's 19-year-old Leah Williamson. Last April, the versatile teenager hit the headlines in the most unusual of circumstances, playing for the England Under-19 side. She had to take a nerve-wracking penalty kick, five days on from when it was originally awarded, after an unprecedented intervention by Uefa. Williamson had converted the original penalty, in a crucial European Championships qualifier against Norway, only for the German referee to mistakenly cancel it out. Uefa ordered it to be taken again, both sides returned to play less than two minutes of football, and Williamson netted from the spot to secure England's qualification for the finals. A breakthrough season in Arsenal's first team followed and, as one of the rising stars in the English game, this will surely not be her last cup final. After battling back from depression and later returning to football following the sudden death of her mother, Fran Kirby won the hearts of so many across the nation when she scored for England at the 2015 World Cup in Canada. Then came the relatively big-money move from her childhood club Reading to Chelsea, and then came the pressure. But under that pressure, Kirby delivered, scoring as Chelsea beat Sunderland to clinch the league title in October and then scoring the club's first ever Women's Champions League goal, as they overcame Scottish champions Glasgow City. This year, the player that England boss Mark Sampson dubbed 'mini-Messi' after her timely intervention in June's 2-1 win over Mexico, has gone from strength to strength and netted both goals in Chelsea's 2-0 league win over Arsenal last month. She is certainly one of the in-form players in the Women's Super League and a safe bet to continue making a name for herself. If Saturday's final goes to penalties, Arsenal will have confidence in their keeper, the Netherlands' Sari van Veenendaal, after her heroics in their quarter-final tie against Notts County. The young shot stopper's three saves in the shoot-out helped them beat Notts 4-3 on penalties, having also knocked out Birmingham City on penalties in the last 16. Her opposite number on Saturday, Chelsea and Sweden's Hedvig Lindahl, kept the most clean sheets in 2015 - eight in 14 Women's Super League games, and is in good form. They will both be expected to impress for their countries at next summer's European Championships. In 2015, opposition managers were hailing Chelsea's "magnificent" front four of Aluko, Gemma Davison, Ji and Kirby. But now that four has become five, with the addition of Birmingham captain Karen Carney in the winter. It is unclear which four of the five manager Hayes might opt to start with, but with England duo Davison and Carney on the wings, Chelsea will inevitably be dangerous. Among those trying to stop them will be England defensive duo of right-back Alex Scott and centre-back Casey Stoney, who team up once again with iconic former England forward Smith, in search of yet more silverware. The trio were all part of the Arsenal side that won the 2014 final at Stadium MK, beating Everton 2-0. 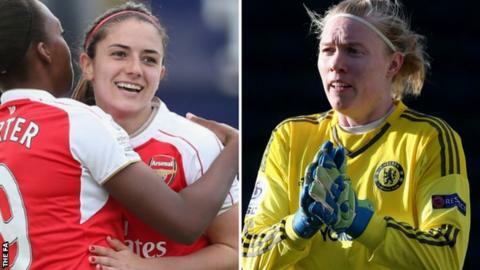 Other internationals preparing for Saturday's game include Arsenal's Spain trio Marta Corredera, Vicky Losada and Natalia, their young England striker Danielle Carter, who netted a hat-trick on her international debut, and Chelsea's reliable England defenders Gilly Flaherty and Claire Rafferty. It is a chance for them all to shine under the Wembley arch and the watchful eyes of millions on live television.